More than a dozen sailors on board an Indian Navy submarine are feared dead after it caught fire, exploding and partially sinking at a naval dockyard in Mumbai. India’s defense minister A. K. Antony confirmed that navy personnel had died in the explosion. Earlier reports stated that at least 18 people were believed to be on board when the submarine caught fire. It's said to be the worst accident for the navy's submarine fleet since India’s 1971 war with Pakistan. The explosion sent a huge fireball into the air and had nearby sailors jumping into the sea in panic. "There was an explosion immediately after midnight in the forward side of the submarine, where missiles and torpedoes are kept to be used whenever necessary," a naval source told Reuters. "Now the submarine is tilted on the front side and all hatches are closed. They are trying to open those now." Divers were desperately trying to pry open the hatches of the vessel. Defense Minister A.K. Antony gave no other details but said he felt sad about the loss of lives. “It’s a loss to all of us. It’s a tragedy,” Antony told reporters before leaving for Mumbai to monitor the situation. 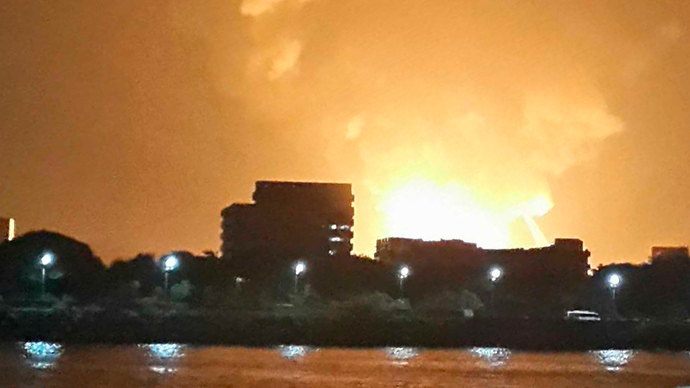 The blast happened on the INS Sindhurakshak around midnight and was shortly followed by a massive fire. Many of the sailors on board the submarine reportedly managed to jump off to safety, but more than a dozen are feared trapped inside the hull. The vessel partially submerged after the fire. Several people have reportedly been rushed to hospital following the incident. Fire brigades were battling the blaze for almost three hours to prevent the fire spreading to other vessels docked nearby. The INS Sindhuratna, which was docked close to the Sindhurakshak, was pulled away to safety. Although it's believed that the explosion onboard the Indian submarine was likely an accident, an investigation was launched to establish the exact cause, the navy said. The number of crew in the boat when fully operational is 110. One or two men are usually on duty on top of the submarine, according to the source. They either jumped into the water or were thrown off by the force of the explosion. There was no immediate comment on the status of the sunken submarine’s torpedoes and other weapons. 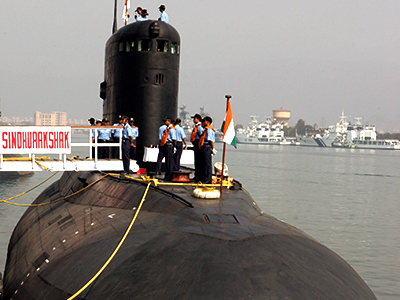 The Sindhurakshak is a 16-year-old Russian-made submarine which recently underwent an overhaul and upgrade. 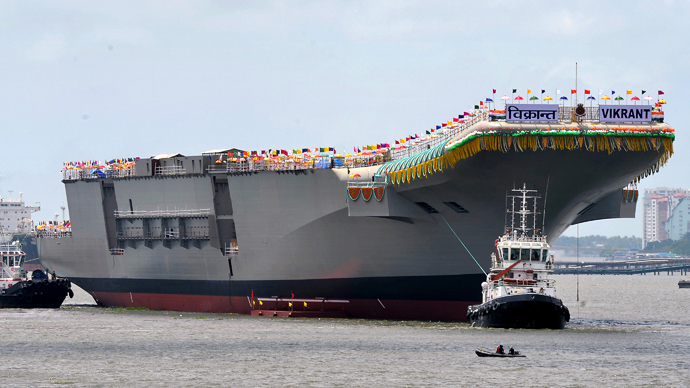 The Indian Navy spent some $80 million on the upgrade and expected the vessel to be operational for at least another 10 years. 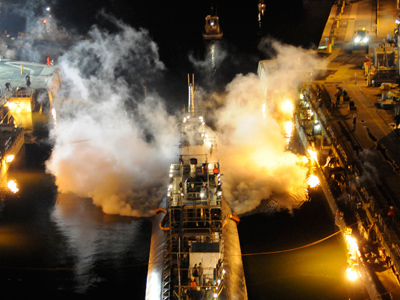 The submarine was involved in a previous incident in February 2010, when an explosion in the submarine’s battery compartment started a fire aboard, killing one sailor and injuring two others. A source told India Today that this week’s explosion was likely caused by a leak of hydrogen gas during battery recharging – the same reported cause of the 2010 incident. The damage the submarine sustained three years ago prompted a 2 1/2 year refit in Russia. India's fleet of 14 submarines is said to be in urgent need of modernization, hampered by delays in prompt government decisions as it confronts corruption allegations.